Bovada Sportsbook is the site we consider to be the most reputable in the industry. They do everything just a little bit better than the guys next door which is why they earn such high ratings across the web. New players can take advantage of a 50% bonus up to $250, or up to $500 if you use Bitcoin. All in all we feel Bovada is an excellent choice for US players. Bovada was launched in 2011 when the Bodog brand decided to dedicate an entire brand to the USA sports betting and gambling market. Bodog has been a trusted presence in the online gambling industry since 1994 and remains active in the International markets. Bovada is one of the premier US friendly online sportsbooks delivering the type of first class betting experience we've come to expect from the Bodog brand. Today, a large portion of the group is owned and controlled by the Morris Mohawk Gaming Group, located in Kanhawake, Quebec, so that’s also where the site is licensed and regulated. As an offshore site, Bovada has no trouble accepting US residents and is in fact set up to cater specifically to Americans. They also make it a point to cater well to experienced gamblers. Now, novice sports bettors can figure things out easily and have a great time, but with Bovada’s bet slip features and intricate betting system, pros definitely feel right at home. Toss in 24/7 live customer support, ironclad security on the site and for your account, and some very lucrative bonuses, and you’re looking at a site worth trying out. While some may be thinking that the layout of a site is trivial stuff, you have to understand that the user interface and functionality of a sportsbook matters a great deal. After all, if you cannot easily see, read and fully understand the lines and bets, how will you ultimately navigate them and place your money down? Bovada’s user interface is unique; when you log onto the site, there’s nothing that really stands out as sports betting-specific. You’ll see an MLB banner, or a banner for whichever major sport is in full swing at the time, and you’ll see a tab that says “Bet Now.” If you’re not already a member, you can click this and go through an easy sign-up process. Though if you have already joined, simply scroll down. This is where you’ll find the top sports and lines. The only issue here is that the lines load up as you scroll down, so if you have a slow connection or a slow computer/phone, things are going to load slowly and you might get frustrated. So, for these reasons, we’ll give the homepage features 8/10. Though the overall navigation couldn’t be any simpler. 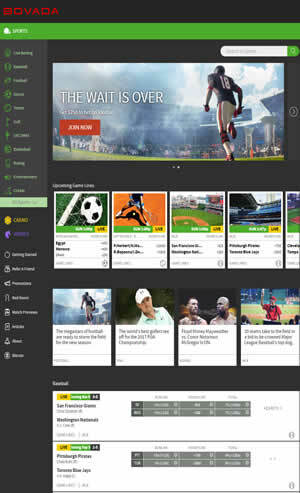 To the left-hand side of the screen, you cannot miss the Sports section, where it tells you all the different sports and events on which you can bet. You’ll also see the other Bovada sites from here, including their casino and poker room. These are separate sites which require a separate sign-up, so keep that in mind if you wanted to play something different. Lastly, Bovada offers you a neat little bet slip on the right-hand side. With this, you can leverage and parlay and really keep track of what you’re doing. It’s a great little feature to have. When it comes to betting options, Bovada definitely has you covered. Even in niche sports, you’re likely going to find a full assortment of lines and options. Point spreads, over-under lines and moneylines are just the tip of the proverbial iceberg. You’ll also find parlay options, proposition bets, and live betting options. On the left-hand side, just click on the live betting option and it brings up its own window, and from there you’re going to see every sort of live bet that the site has running currently, and even which live bets are coming up. As of late July, what we find on the “Live Now” screen is a lot of baseball, MLB and international, all sorts of tennis from big and small tournaments alike, and even a bunch of soccer. Then it tells you at the bottom about the golf and cricket matches coming up. When football season is in, you’ll find options for that. When the Olympics start, you’ll find options for that. Bovada has more live betting options than any other sportsbook we have checked out. So, for this feature, we’d say that’s definitely worth a 10/10. Some of Bovada’s covered sports include: Baseball, basketball, soccer, tennis, UFC, martial arts, golf, football, hockey, cricket, horse racing, volleyball, wrestling, handball, rugby, e-sports, racing, Olympics, politics, and much more. This is a very diversified betting section. The e-sports are a big plus here. They’re becoming more and more popular, and you’ll find all the tournaments for League of Legends, Starcraft 2, Dota 2, Counterstrike, and more. Sure, Bovada has all the usual suspects here, like credit cards (MasterCard, Visa), bank transfers, checks, etc, but do they stand out in any regard? The fact of the matter is that we’re living in 2016, and the banking methods have really evolved well past credit cards and bank transfers. Some people are looking for payment options that are more reliable, quicker, and definitely more secure. For Bovada, you don’t have to hand over your CC info or your bank’s routing numbers. This is a Bitcoin site, which means you can simply enter your Bitcoin wallet address into Bovada and enter and/or withdrawal whatever you want, and you will never have to hand over your personal financial information to the site. Bitcoin is perhaps the most secure payment method on the planet, and it’s also 100% free and the transfers go through in an instant. As soon as you deposit your money with Bitcoin, you can start gambling. And if you win, you can take your money out right away and it’s going to be added to your Bitcoin wallet instantly. We could go on about some of the other options at Bovada, but other than CC options, there’s not much more Americans typically use. So, what we suggest is that you use the Bitcoin option. You don’t have to purchase whole coins; per the name, you can buy a “bit” of a coin, for any denomination you choose, and you then have a free, instant, secure line with Bovada or any other gambling site you want to join. Definitely a 10/10. Some sites hold onto that money tightly and don’t want to let it go with a promotion. Bovada, however, is a lot more generous in the bonus territory. For their sportsbook, you can take advantage of a $250 welcome bonus. This is a 50% deposit match bonus on up to $250, which works out to $250 free if you deposit the full $500. Most people start smaller, and that’s fine. For every $100 you put in, you’ll receive $25 for free. If you use Bitcoin for your initial deposit, your welcome bonus doubles to a nice 50% match up to $500. Now, Bovada isn’t setting any records with this sort of bonus, but one thing you’ll notice about this site is that the sports betting bonus is a lot easier to clear than other bonuses. For instance, there’s a $3,000 welcome bonus with Bovada’s casino, but you’ll have to bet and bet and keep betting to meet the rollover requirements. With the sports bonus, simply place a few bucks down on the sports you like to gamble on, and you’ll be able to clear that money in no time at all. The site’s ongoing promotions are also very lucrative. Their refer a friend program, for instance, gives you a 200% bonus on up to $100 if you can convince someone else to sign up and deposit. Bovada has been known to change around its bonuses, so keep your eyes peeled. By the time you read this and end up on the site, they may have another bonus or ongoing promotion being offered, especially if you catch them in the midst of changing seasons; e.g. bye-bye to baseball and hello to football. This is when you can catch some good bonuses and promotions. Is Bovada Sportsbook Legal For US Players? You can check out our homepage for an answer to the question: “Is online sports betting legal in the United States?“. But for a quick answer, Bovada can in fact legally offer their services to American players because they are licensed and regulated outside of US borders, so they are not violating any U.S. gambling laws. Bovada is not accepting bettors from DE, MD, NJ or NV at this time. We’d say that Bovada has earned a 4.7/5, at least in our estimation. It all starts with the massive amount of betting options you find on the site. You can bet politics, all sorts of e-sports, international sports, and so much more. And the best part is that you can bet on most of this stuff via the site’s live betting options. They’re also lucrative with the bonuses and promotions, giving you not only a welcome bonus but also setting up a lucrative referral bonus. Theoretically, you could make a living by being an affiliate for Bovada. Then you get to something like their banking methods. There’s no need for a bunch of rhetoric here; suffice to say that having Bitcoin is a huge boon for gamblers. When you add it all up, and throw in quality support, tight security, and all sorts of rewards and trophies for continually conducting fair business, you’re looking at a site we are proud to deem trustworthy.